Get a FREE data audit! StrategicDB is a data cleansing company which focuses on customized data cleaning projects. Some of our services include: data de-duping, data categorization and normalization. We work with third party data providers to verify and/or enhance your current data. We also provide consulting services for data governance and help build out data quality dashboards so that you can monitor the health of your data post data cleansing. Since each business has unique data cleansing needs, we typically start the process by offering free data audit report. 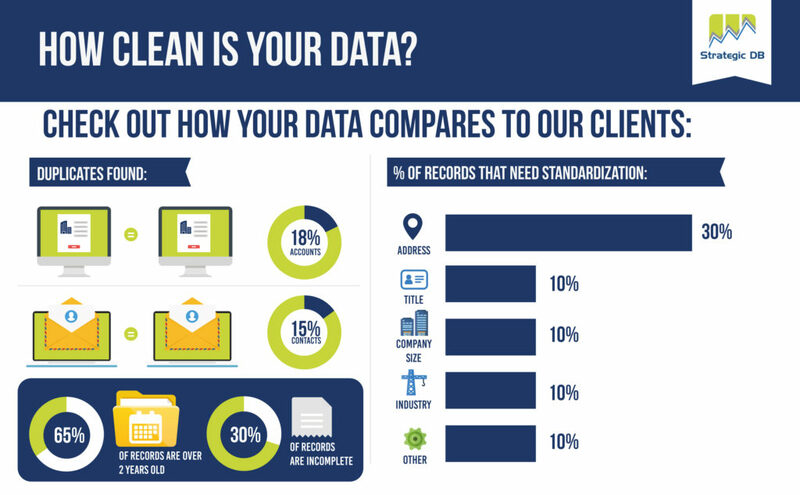 Once your data is cleaned we can also address any analytical needs you may have. Our analytical services focus on marketing and sales analytics and includes: segmentation modelling, social media analytics, content analysis, dashboard set up (we are official partners for Datorama!) and other ad hoc analytical needs!